I haven’t been a very dedicated participant in the Dark Days Challenge lately. Life is busy and my little blog has taken a back seat. We are still eating as local as ever, though! This time of year, most of my meals fall well short of 100%, but I would say that much more than half of the food we eat is produced locally. Veggies are the only staples we eat that aren’t local, but we still have local carrots, squash, beets, and cabbage. We finished off our local onions with this week’s all-local meal: pulled pork. Everything for the meal except the potatoes came from the farmer’s market – even the barbeque sauce! My husband came home with a giant hunk of pork (a loin end roast, for those who know cuts of meat). He browned it, then put it in the oven for a few hours with some onion, garlic, carrot, a potato, and some turkey stock until it was fall-off-the-bone tender. After spicing it up with Jamaican barbeque sauce made by Derrick, one of the farmer’s market vendors (GenuineJamaican.com), we served it with steamed spinach (the first local greens of spring!) 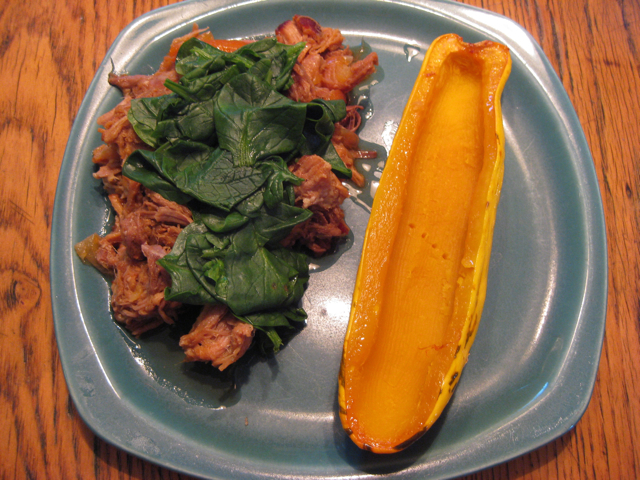 on top and a baked delicata squash on the side. Man oh man, it was so good. At last, farmer’s markets have opened for the season! I shopped at the Lyndonville farmer’s market last Friday and was very happy with the abundance of food available. I came home with bok choi, spinach, two kinds of lettuce, beet greens, eggs, sausage, ground beef, syrup, and Jamaican curry chicken pastries. Finally, all all-local salad! Goodbye, California lettuce. 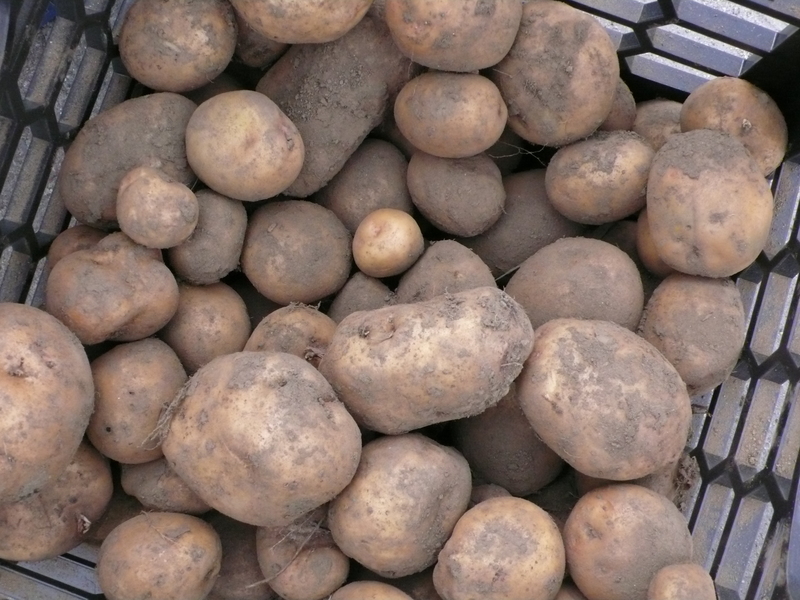 The Lyndonville farmer’s market has a much better location and time this year. It’s located downtown in Bandstand Park, with plenty of parking, Fridays from 3 to 7 PM. Folks heading home from work or coming into the area for the weekend can stop on their way and stock up with fresh food for the weekend. I just got back from a trip to Montpelier to visit my sister, and as luck would have it, it was farmer’s market day. Having horribly miscalculated our vegetable needs, we are beginning to run out of all the storage crops we carefully laid in a couple of months ago. We are out of onions and beets, and nearly out of garlic and potatoes. The carrots-packed-in-leaves experiment did not go well; maybe if we had a more humid root cellar the carrots would be crisper, but our cold pantry is bone dry and our carrots are less than perky. I could have spent much more time and money at the market, but I was on a tight schedule, and veggies were my priority. I walked straight past the vendors offering cheese samples, frozen meats, and tempting baked goods. Veggies were on display in abundance; winter squashes, carrots, beets, turnips, onions, shallots, garlic, fresh sprouts, potatoes, sweet potatoes (! ), red & green cabbages, kale, brussels sprouts, frozen berries. Wow. I left the market with a good supply of roots to sustain us for a few more weeks. 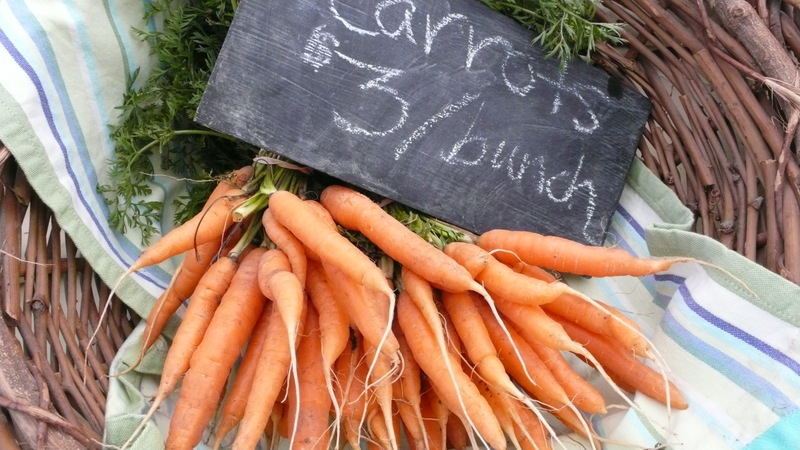 A monthly winter farmer’s market has started up this year in Lyndon. The November market was great, with tomatoes, lots of salad greens, and storage vegetables available, along with meat, eggs, baked goods, canned goods, and crafts. Unfortunately, the December market had few veggies available: spinach and lettuce were all we could find. According to Cathy Paris, organizer extraordinaire, local farmers are already planning to expand next year’s late-season growing now that they see there is a demand. I’m hopeful that, while the Lyndon market might never be as huge as Montpelier’s, Northeast Kingdom residents will be able to buy local produce year-round in the future. This weekend we did some major stocking up for the winter. 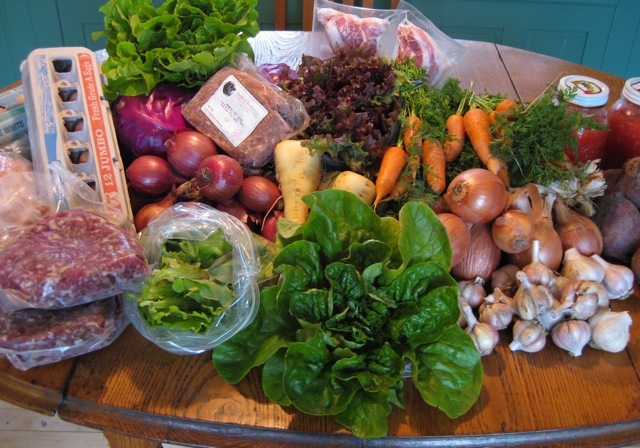 At the St. Johnsbury farmer’s market, we picked up lots of carrots, onions and garlic, along with some red cabbages, delicata squash, lettuce, radishes, honey, lamb, Jamaican chicken pastries, and two kinds of sheep’s-milk cheese. We also arranged to pick up a dozen chickens at Wild Goose Produce next week on the day the chicken go to the big henhouse in the sky. Our next stop was the St. J Co-op, where we got apples, cider, and beets (the farmer’s market folks had sold out before we got there), as well as brie cheese, pesto, and rye flour. All local! On the way home my daughter wanted to stop at a pumpkin patch in Lyndon, and we found some pumpkins and gourds for Halloween decorating. 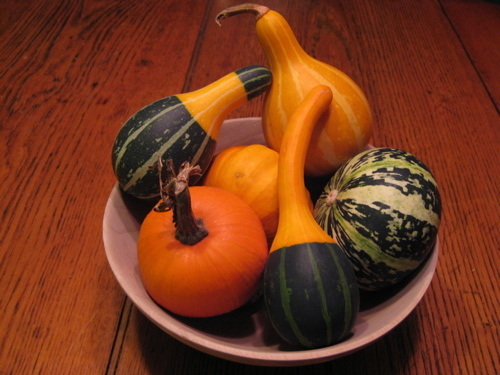 On Sunday we went to the Lyndonville farmer’s market and got a turkey, potatoes, a pumpkin, and more gourds from Tamarlane Farm, some pork sausage from Speedwell Farm, and some squash and even more gourds from Woods Edge Farm. We don’t have a root cellar, but we do have a cold pantry where we can store a lot of food. 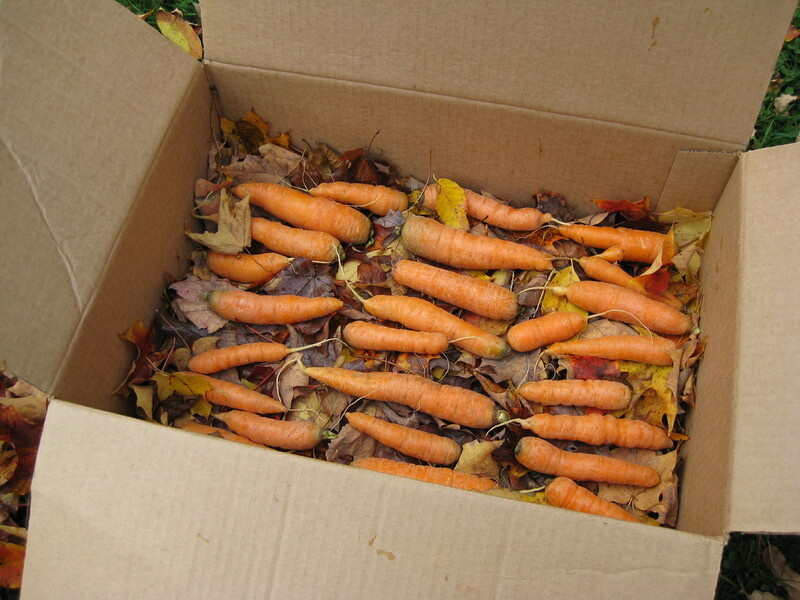 I packed the carrots in damp leaves in a cardboard box, as Curtis from Mountain Foot Farm recommended. 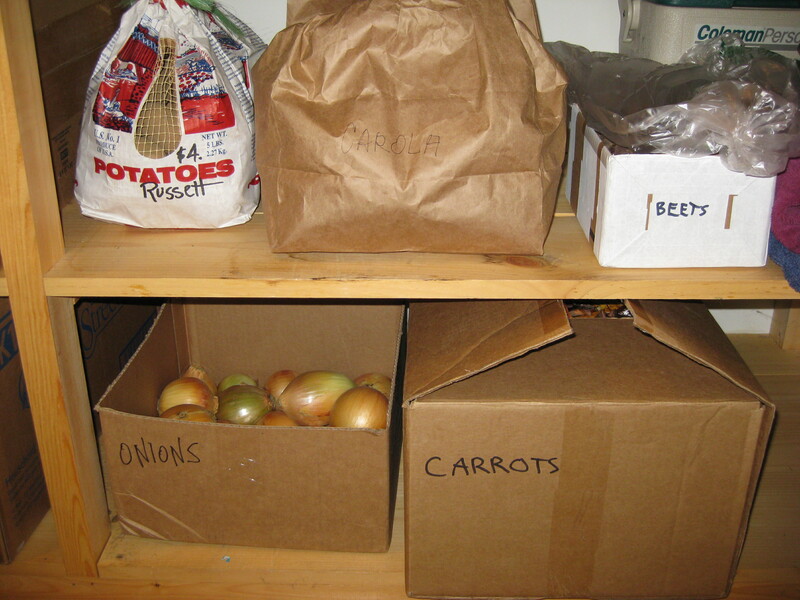 Our pantry is now pretty well stocked with roots: onions, garlic, carrots, four kinds of potatoes, and beets. We spent a lot of money this weekend, but we will make up for it over the fall and winter when we don’t have to shop as much!